This is a scarce edition of the methodology of Louis A. Saint-Jacome. 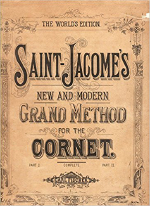 Information: Louis A. Saint-Jacome wrote his famous "Grand Method For Trumpet Or Coronet" in 1870. Generations of players have learned to play using his method. It is considered one of the great pillars of trumpet methodology, and has provided trumpet players with the foundation necessary for success on the instrument for well over a century.